These terra cotta bunnies are easy to make and are perfect to give as Easter gift baskets. Make them with your kids or as a special hand made gift! Easter is the middle of April this year but when you think about it that will be here like a flash. Is it just me or does time seem to speed up as you get older? The realization that Easter is literally just around the corner did make me get started on some crafts. I made these cute Easter gift baskets that you can give to your kids. 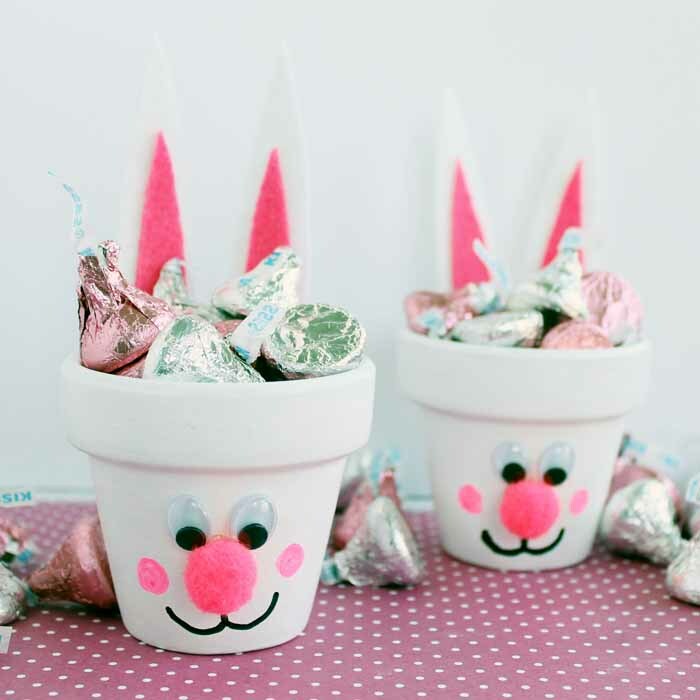 You can even get the kids to help you make these terra cotta bunnies! In case you can’t see the video or need more instruction, just follow along with the steps below. Paint your terra cotta pot with a few coats of white paint inside and out. This may require multiple coats. Cut ear shapes from white felt (stiff works best). Cut smaller ear shapes from pink felt. Adhere pink felt to white felt with either glue or the self adhesive on the felt. Hot glue ears to back of clay pot. Hot glue on google eyes and pom pom nose to front. Draw on mouth in black. Draw on cheeks in pink. Add in candy and give to someone special! 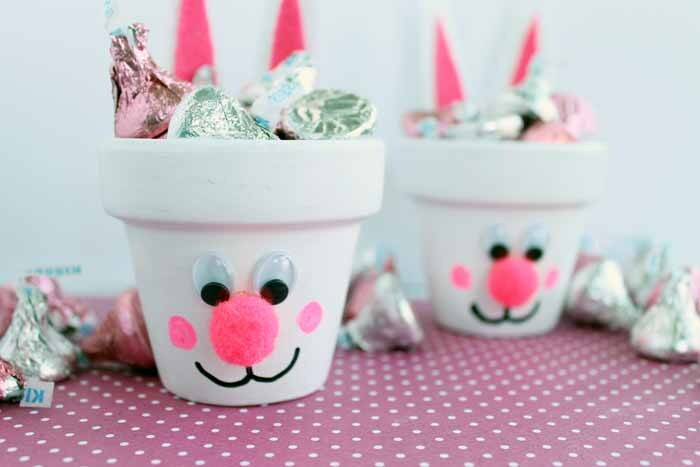 Let the kids help make these cute Easter crafts as well. You can substitute a tacky glue for the hot glue to make it completely kid friendly. Get your supplies and get started on these Easter gift baskets today. Your kids will love getting their very own terra cotta bunnies for Easter! 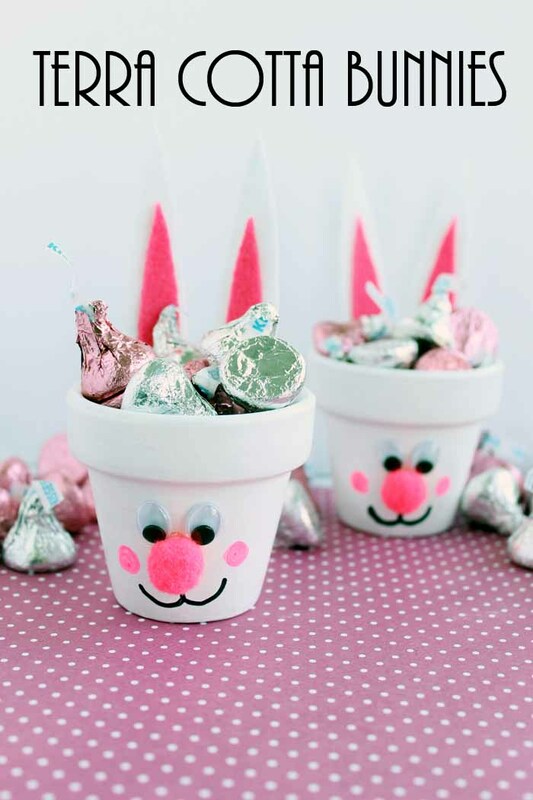 Now add the supplies to your shopping list and make these great Easter crafts today! next post: Carrot Wacky Cake Recipe – no eggs, milk, or butter! These are super cute little pots. They will look equally as adorable with a little African violet plant or other small plant afterwards, much better than having a plastic Easter basket hanging around after Easter. 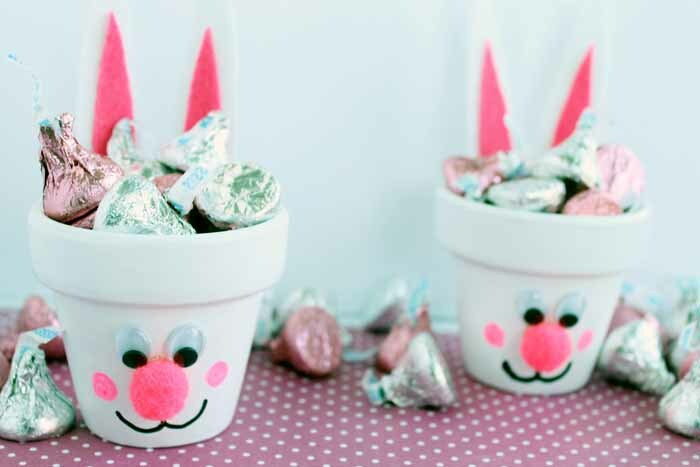 What cute bunny pots. Love them. These are so cute – I would be honored if you shared them on the Pleasures of the NW’s DIY link up! These are adorable and I look forward to making them. Very cute idea and thanks so much for the video. Very cute. So many uses for those! These are super cute. What a great way to take a little something to your neighbors and friends for Easter. These baskets are so sweet. The perfect spring/Easter gift. These are adorable. But I do love anything from clay pots. This is such a cute idea!! I have to look at my stash because I think I have some terra cotta pots and my girls would love to make some bunnies!